My husband and I recently moved west to Perth. We are excited to explore all this gorgeous city and state have to offer. As I discover things I shall share them with you. If you like an article "heart" it and subscribe to see more. While sipping tea conjures up images of daintily lifting a fine china cup with the little pinky raised, savouring a hot cup of coffee can seem a little more robust. And as we all know, any man would enjoy plates of delicious sweet and savoury food. The innovative High Coffee extravaganza offered at the Market Lane Bar can be enjoyed by men and women alike, and is a great place to take your "man" to connect over good food and great coffee. 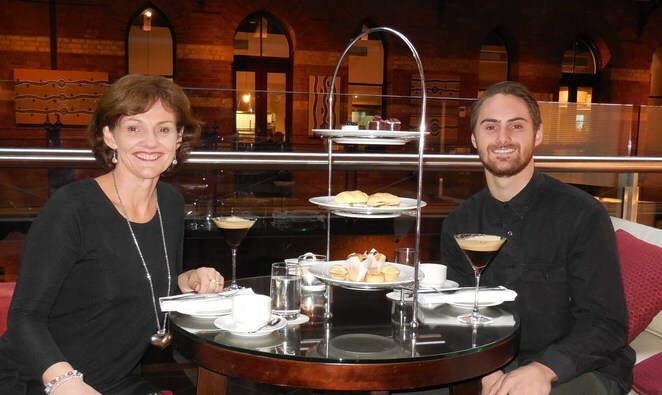 My son, who usually may not be so keen to join his Mum for some mother and son time, was happy to accept my invitation to high coffee and we had a fabulous time laughing and chatting together. The High Coffee degustation begins with an espresso martini, which offers a real caffeine kick to start. Then there is a three-tiered platter of scrumptious savoury and sweet delicacies accompanied by delicious Arabica coffee. We were relishing these morsels and working our way through the selection when two more plates arrived. Needless to say there was plenty of food. We ended up having to take some of the selection home, as there was too much for us to finish in one sitting. The Market Lane Bar offers High Coffee at tables in the sumptuous bar or relaxing on a lounge in one of the booths that overlook the light filled glass atrium of the InterContinental Hotel. High Coffee is served from 2pm-5pm on Wednesday to Sunday. Bookings are essential on weekends and recommended on weekdays to avoid disappointment. Last bookings are at 3:30pm. The Market Lane Bar is set within the InterContinental Hotel in Melbourne's historic Rialto building, with a backdrop of the hotel's spectacular light filled glass atrium. Where: Market Lane Bar in the InterContinental Melbourne The Rialto 495 Collins St, Melbourne.